Update on theft! 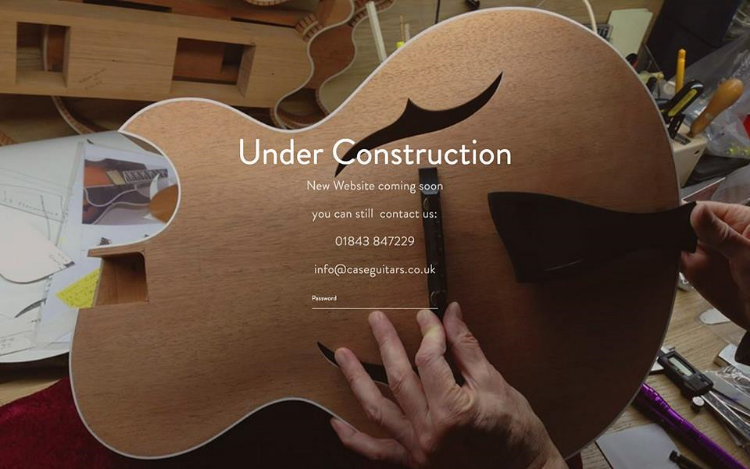 Big thanks to the team at Folkies Music, London for alerting us when this guitar showed up in their shop in Kilburn! 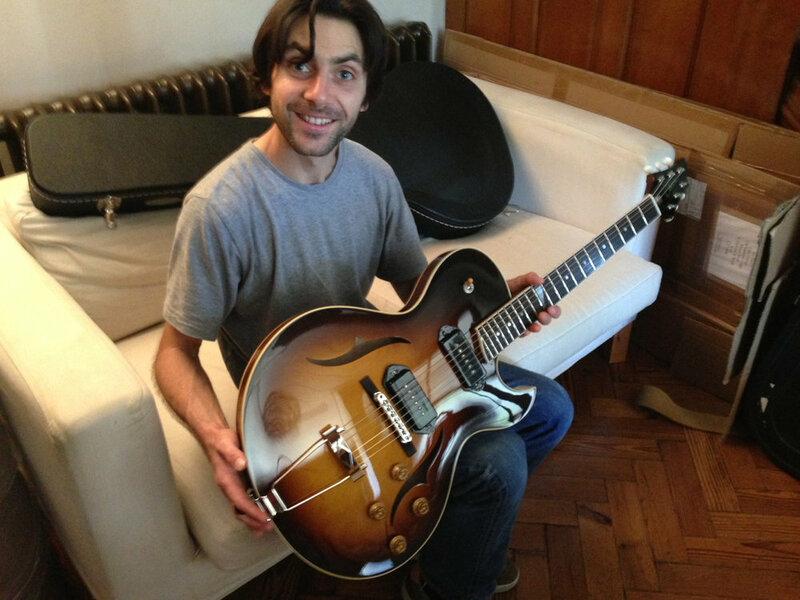 Phil Robson will play his J3 Semi-hollow during his tour with Phil Robson's Organ trio from Nov 11th-19th. First night of the Margate Jazz Festival, Richard Rozze debuts his new Case J3 thinline, playing with the award winning Jo Doolan. 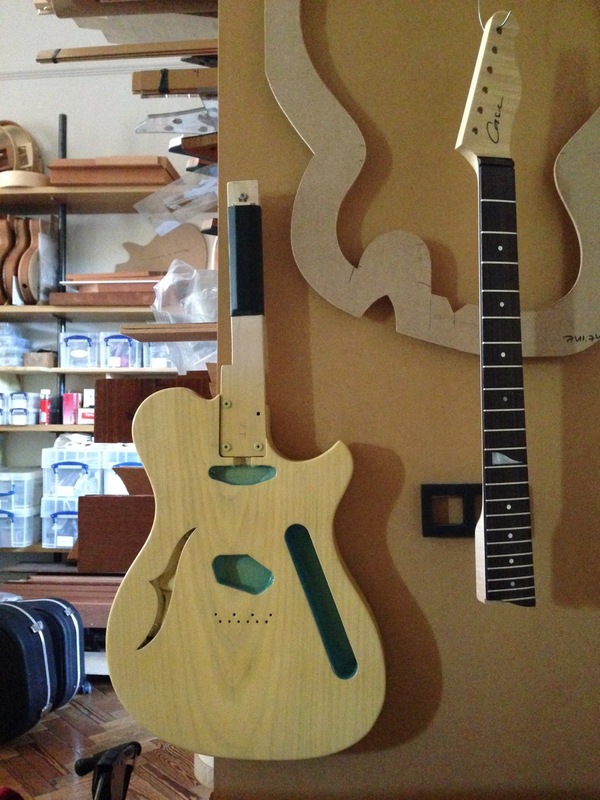 London based Jazz guitarist and composer Matt Chandler has commissioned a new J3 Florentine, thinline semi. We haven't built this configuration of J3 before so we produced this Photoshop visual for Matt to see the end result. Richard Rozze tries out his signature J3. We think his expression says it all. 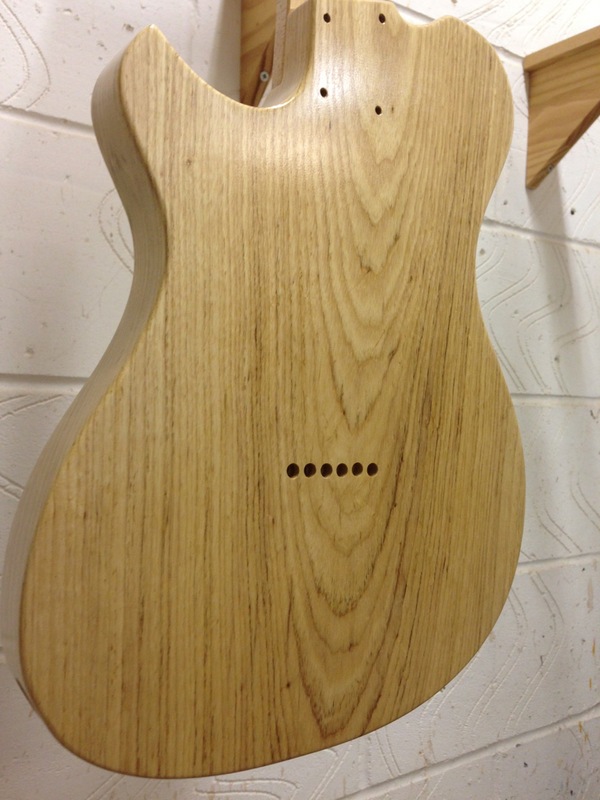 This is a new thinline model we will be adding to the range. We are very excited to be working with talented guitarist and composer Richard Rozze to build him a J3 Florentine 'Thinline' hollow body. Richard's vintage 1956 Gibson ES 225 is becoming fragile and with it's increasing value, makes taking it on the road more of a risk. The brief is to recreate the feel and sound of his beloved Gibson 225 but with the shape of a J3 florentine to withstand the riggers of live and recording work. This new addition to the range will be the 'Richard Rozze' signature model and will be featured on his next recording to be released by Pathway Records. Will keep you posted! Skip McDonald put the J2 flat top through its paces during a fantastic set at Ramsgate's Queen Charlotte on 30th July. Skip McDonald with his Case J2 at Adrian Sherwood's studio working on his latest recording. A truly amazing sounding album in the making. Looking forward to it's release. Keep you posted. Seen in this month's Guitarist magazine '10 Questions' - Great that Phil Robson would rescue his Case J3! "I had the J1 Custom '57 Goldtop down to play 3 songs at the show on Saturday... 6 songs later I still hadn't changed guitars! After the gig everyone was asking about the guitar and saying how great it sounded. I absolutely love it!!" Tim Mills, the man behind Bare Knuckle Pickups and guitarist in the Bare Knuckle Blues Band has commissioned a very special Custom JV. Specificattion includes a ‘Buckeye burl’ carved top on a mahogany body with a layer of flame maple between the two. A mahogany neck with a 16 inch radius ebony fingerboard, 22 fat/high Dunlop 6000 frets for massive bends. Loaded with Bare Knuckle humbuckers - ‘Rebel Yell’ bridge ‘Emerald’ neck. Two 550K volume pots. "I used the JV custom at a Bare Knuckle Blues Band show last night - absolutely wicked! I played it for a track we do with a long improv solo in and it simply wailed. Lots of very positive comments... Nice output but still really dynamic - you should have heard the controlled feedback I was pulling off - very cool indeed". Andy Powell of Wishbone Ash is featured in Tony Bacon's fascinating new book on the Flying V and shows Andy's 'Buckeye burl' Case JV. Jamie Woon has selected a Case J1 to take on his 2011 UK tour. 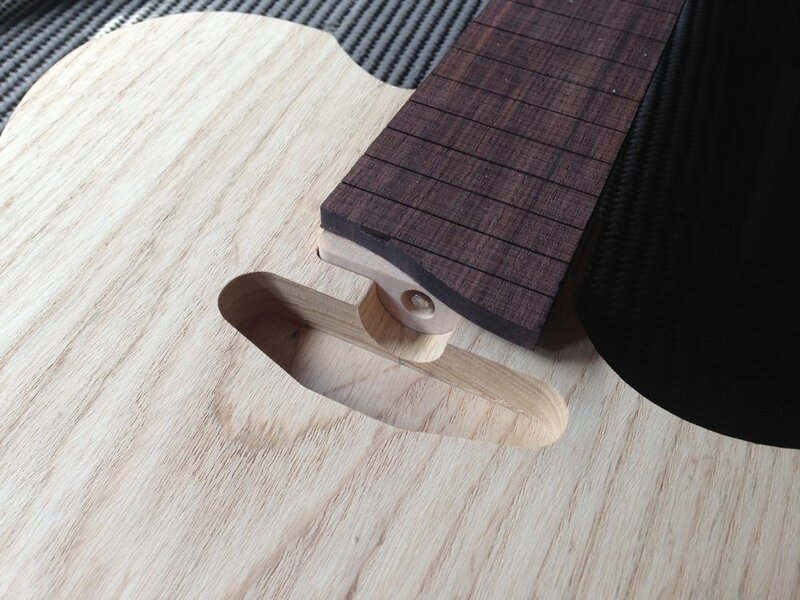 Jamie loves its full warm tone and the aesthetics of not having any pickup mounting rings. Jamie has been chosen as one of the hottest artists in 2011, making No.4 in the acclaimed BBC Sound of 2011 poll. Guitar legend Andy Powell takes delivery of his new Case APJV and plays it during the 2010 Wishbone Ash world tour. The top is carved from an exquisite piece of Buckeye Burl sourced from California with a mahogany body and neck featuring pickups built by Andreas Kloppmann and a Fishman Powerbride. "I love the neck profile... a very toneful instrument and using both pickups in the middle position produces a wide array of tones depending on how I balance the pickups volumes... Its a work of art!" Phil Robson, playing his Case J3 semi hollow archtop, accompanies Barbra Streisand for a one-off BBC Jonathan Ross TV special, featuring Barbra Streisand as the only guest. Phil is part of a quartet with Tamir Hendelman - piano, Bobby Worth - drums and Andy Cleyndert - Bass. Well, the new APJC1 Case guitar is ready. It's a gem and features two Andreas Kloppmann vintage, transparent and dynamic sounding, PAF style pick-ups with the Andy Powell 'beef' spec on the bridge pick up. The trem has been modded with the Easy Mute trem arm (easy access for muting plus absolutely no trem wobble). The finish is nitro cellulose - warm and cosy to the touch and eye. The top is an awesome piece of quilted maple. Back and neck Honduras mahogany. The nut is graphite. 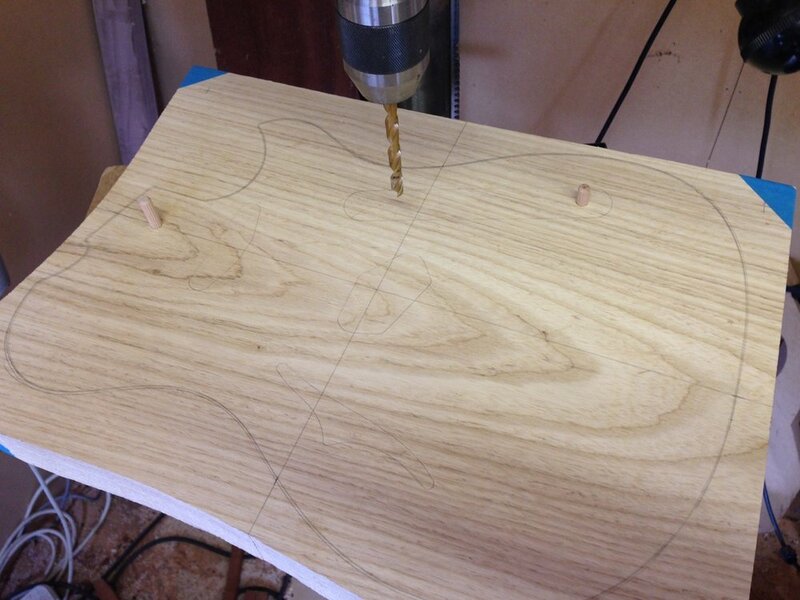 Tuners: Sperzel locking. 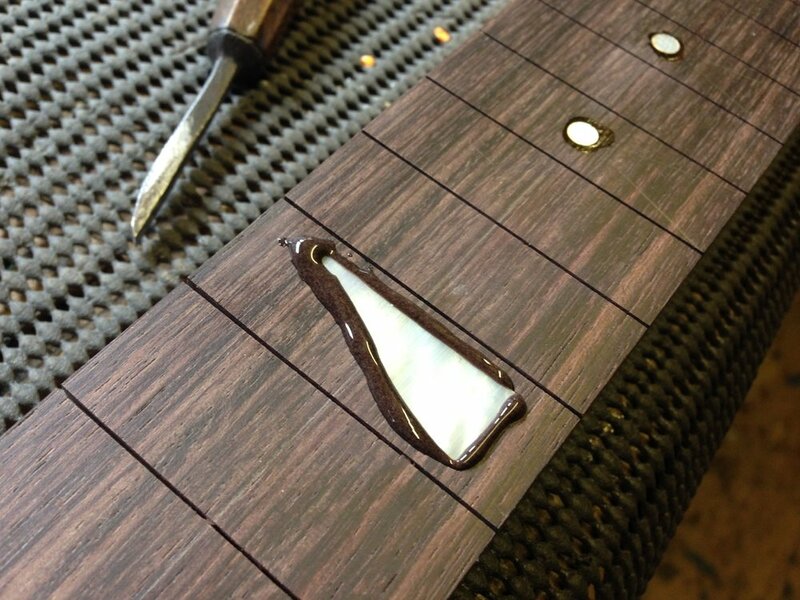 Frets: Dunlop 6000 and fingerboard ebony. The piezzo system is L.R. 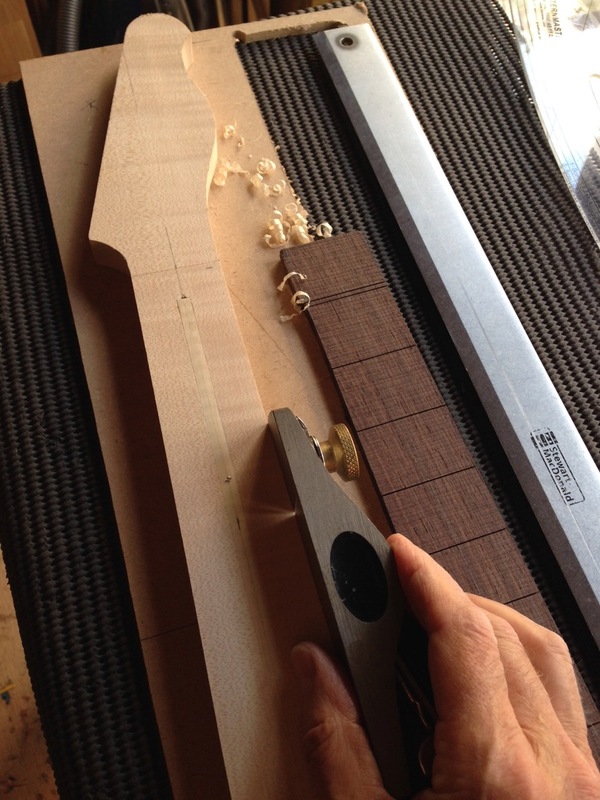 Baggs and the truss rod is a two way adjustment. This guitar is a beautiful looker - almost feminine in shape. 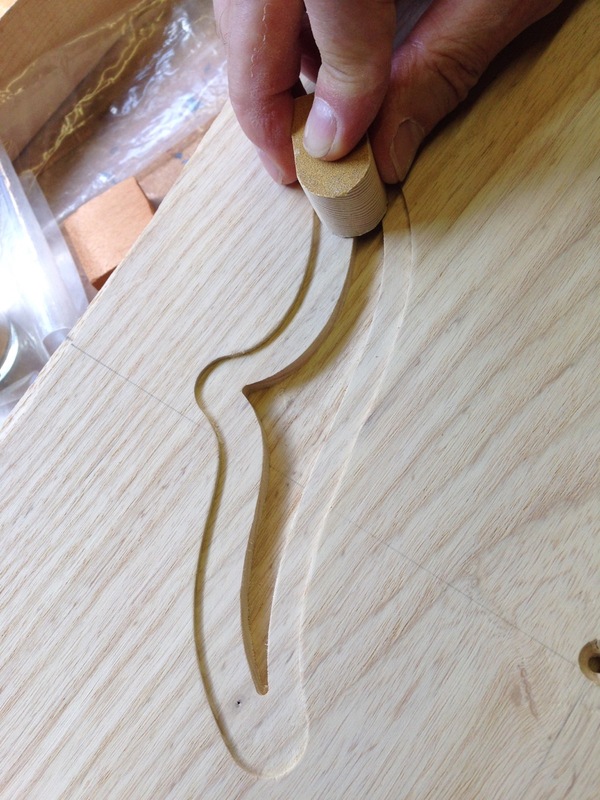 Jon, who is a designer by profession, first of drew the Les Paul influenced shape by hand. It's off set which gives it this fluid look. He then tried to replicate it's shape on the computer but it didn't work so the original lines are what he stayed with. To my eyes and after wearing the guitar on my shoulder, it feels amazing. 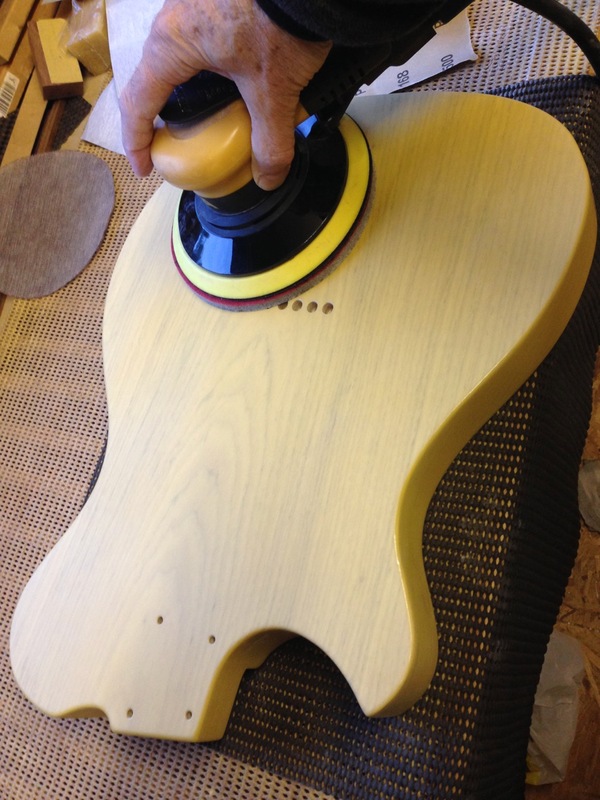 The neck joint runs through the chambered body - I forgot to mention that crucial design element. I think he could be on to a winner here. It's tough to update these classic styles but I believe Jon has pulled it off. We see this working in car designs these days, but it takes real confidence to do this with guitars and to actually pull it off. It makes me very proud to be able to feature these superbly hand made British instruments in the band. Thanks Jon! Nemo Jones, receives his new J1 single cut. Nemo's particular requirements were to have a highly figured maple flat top with a tobacco burst, nickel dome knobs, pigtail bridge and ebony fingerboard with no inlays. Nemo collected his guitar on the monday only to play the next day at the 'Slaughtered Lamb' London. Usually playing acoustic when solo, Nemo plalyed the J1 for the whole set, bar one song when he played his Taylor acoustic. 'It feels part of me' 'This guitar is a work of art'. 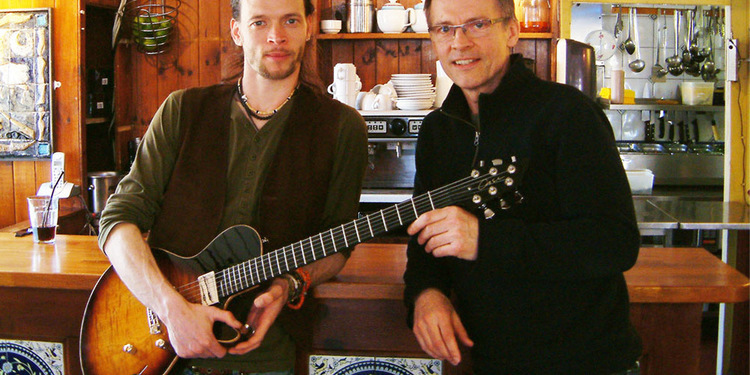 Internationally renouned jazz guitarist/composer Phil Robson endorses the Case J3 semi-hollow archtop. Phil's J3 will be his main guitar for live and recording work. 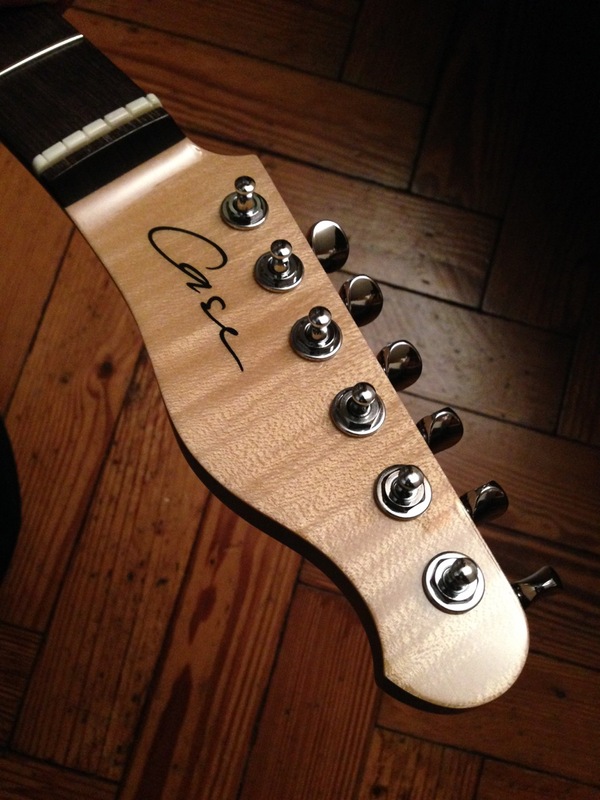 Phil says: "I loved the feel of the J3 as soon as I played it. The neck seems perfect and the tone and volume are so even across the strings. It has great dynamics, which is perfect for the way I play. It stays in tune really well and it's light to hold which is a treat in a 'jazz guitar' although the J3 is much more than that. An amazing guitar!" Andy Powell of Wishbone Ash takes time to checkout the new Case JV archtop prototype. 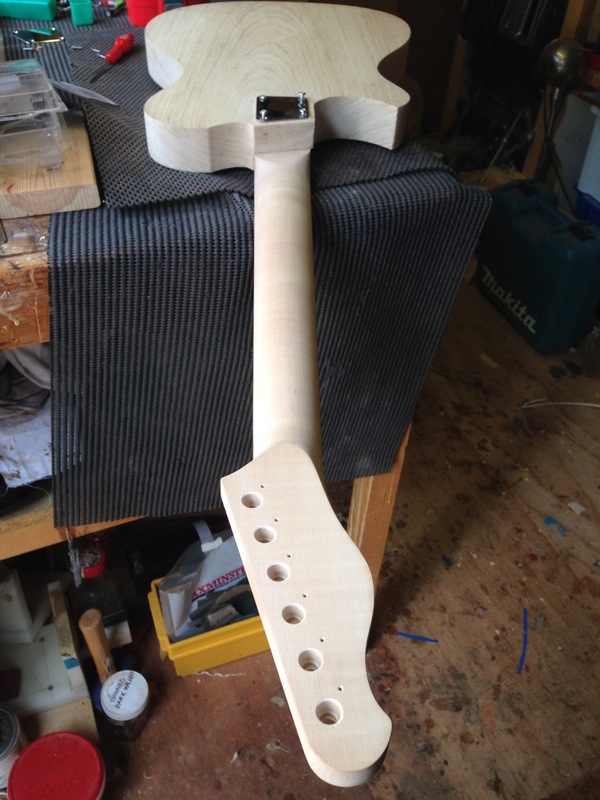 Andy, who made the guitar that he played in the early days of Wishbone Ash, was very impressed with the build quality and has suggested a few tweeks that will further enhance this model. 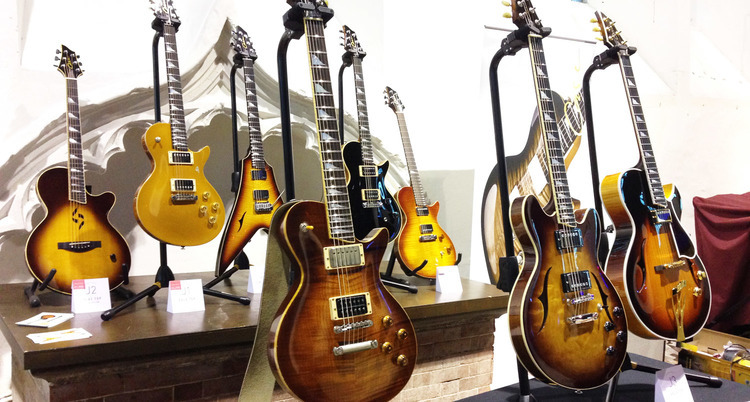 Our first Guitar Show - Excel, London. Stand organiser and website creator Ruth Case pictured. Main man Maxi Jazz of the band Faithless receives two of our very first prototype guitars, the J2 flat top and the J3 sem-hollow. A big thank you to Maxi for all the positivity and encouragement.